This page is portraying you the current list of IG police in Pakistan 2019 with their duties, province, regions, duties and all the details which you want to know about an IG of a province. 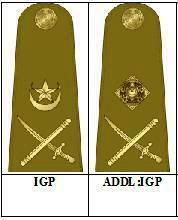 IGP or simply IG police stands for Inspector General Police. This is an administrative level post (BPS 21 – BPS 22). An IGP is the head of all police stations coming under a province such as the IG Punjab, IG of KPK, IG of Railways Police in Punjab and so on. There are total nine (9) IGs are currently working in Pakistan on the different province and department wise. But before shuffling you on that page I would like to make you more familiar with who is an IG police and what are his duties. Well, an IG or an Inspector General is a three (3) stars police officer who is somewhere considers as all in all of the police department. After the Minister of Law and Justice, the Inspector General is the most senior rank while the DIG, AIG, ASP, and DSP comes after one simultaneously. An estimating salary of an IG lies between Rs. 50, 000/- to 120, 000/- PKR at the current time. Furthermore, read on this page and get the current list of IG police in Pakistan 2019 province wise. From The Following List of Current IGP in Pakistan, You can click on any one about to explore its details and to take complete information including name, salary, responsibility and all that you want to know about him.